South Africa is considering legalising rhino horn trade - in a bid to combat rampant rhino poaching, but the suggestion has been met with mixed reaction in Southern Africa. Demand for rhino horn is at an all time high and South Africa, which has the largest reserves of the wild animal, is a prime hunting ground for poachers. Over the past three years, gangs are said to have killed more than 800 rhinos for their horns, which can fetch £22,000 ($35,055) per kg on the black market. Poachers use a chainsaw to cut away the rhino's horns, after darting it with a tranquilizer - drugged and helpless the animal bleeds to death. Large syndicates are involved in this multi-billion dollar trade worldwide - exporting the horns from Africa to parts of Asia and the Middle-East. Despite many anti-poaching measures 310 have been killed in South Africa this year, more than 330 had been killed at the end of last year - and the numbers are set to increase, experts warn. In the five years up to 2005, an average of 36 rhinos were killed each year. Some say today's efforts are "too conventional" and are not enough. Now South Africa has commissioned a study into whether legalising trade in rhino horn could in fact help to bring down poaching, the Department of Environmental Affairs announced recently. "We are impartial at this stage but we are looking at all the suggestions which could help us in the fight against poachers," the department's spokesperson, Albie Modise, told the BBC. "We are awaiting submissions and would consider this if we get authentic scientific backing that this would be effective," he said. The idea is that legalising rhino horn trade would make South Africa directly responsible for meeting the demand for the horns - taking power out of the hands of poachers and placing it in the hands authorities who would also be sensitive to current conservation efforts. These authorities would do market research into global markets of the trade, said Mr Modise. 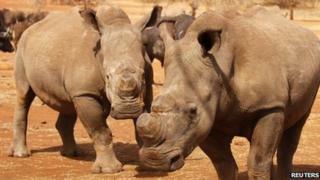 The department says rhino horn stock piles could also be sold to fund further rhino conservation efforts. Mr Modise says the suggestion first came up at a rhino summit held last year to find ways of tackling poaching in southern Africa. Rhino horn trade is regulated by the Convention on International Trade in Endangered Species (Cites) and at present South Africa allows the export of horns only as hunting trophies. But the consideration has drawn heavy criticism from international conversation group WWF, which says this would be a setback by decades the efforts made to stabilise the rhino population. "We understand the need to come up with new ways of combating the rhino horn trade but we are against the notion that legalising it is the answer," said Morne du Plessis, of WWF in South Africa. "How can we control legal rhino horn trade when we can't even control illegal trade. There are too many unknowns for us to even start thinking in that direction," Mr du Plessis said. If WWF believed legalising the industry would be of benefit - it would be done research on the matter itself, he added. Instead, WWF believes that such a move would only further endanger the lives of rhino - and possibly drive them to extinction. There are currently 4,500 of the critically endangered black rhino (Diceros bicornis) spread across southern African nations - a shocking decline from the 1980s when 75,000 of the mammals were mostly found in Zimbabwe. The two sub-species of white rhino (Ceratotherium simum) have a population in the region of 20,000 in South Africa alone. But Campfire Association Zimbabwe - which advocates being able to make a living from wildlife - supports the idea of legalising the trade, saying it is time efforts looked at untested measures as opposed to the current ones which are not always effective. "We view this as part and parcel of placing value on the rhino species. We are looking forward to a time when communities would benefit directly from living with the species," says Charles Jonga, who heads Campfire Zimbabwe. He said his organisation, which was founded in the 1980s, had found that communities which were directly involved in conserving wildlife and were also able to earn a living from it were more keen to protect the animals from poachers. If the trade were legal, Campfire Zimbabwe says, it would give power to countries with rhinos to set appropriate conditions to the sale - for example insisting that the horn not be used for medicinal purposes or perhaps to get clarity on what markets use the horns. Mr Jonga said the demand needed to be met and not shunned, adding that there were ways of doing this without driving the rhino population to extinction. "We must be open to the idea of engaging with the markets and finding ways which would make Africa benefit from the demand and indeed the communities where the rhinos are found," said Mr Jonga. "We must also look at possibilities of breeding the rhino in our communities," he added. Conservationists suspect that most of the illegally harvested rhino horns destined for south-east Asia are used for medicinal purposes. In Vietnam many believe that ground rhino horn can be used to cure cancer - although there is no scientific proof of this - and those horns taken to the the Middle East are used to make handles for ornamental daggers. Some measures have been put in place to curb poaching in South Africa including the deployment in recent months of the South African National Defence Force (SANDF) to protect the animals from poachers by patrolling "hotspots". Millions of dollars have been invested over the past few years on high-tech technology, upping conservations efforts and starting up range expansion programmes all in a bid for counter the effects of poaching on the rhino population. While many countries are desperate for answers to the poaching problem - and many agree that a lot more can be done to save rhinos, critics says South Africa's idea might be too unconventional and untested to get the supports it needs.